Novice Level - These tools do NOT require you to know much about programming! http://metaplace.com/ - Metaplace, a cool project to let people build their own online... thingies. It's not done, though, and no idea when or if it will be. thanks for making this availible! i have always been intrested in visual novels! I cant wait to try some of this out! 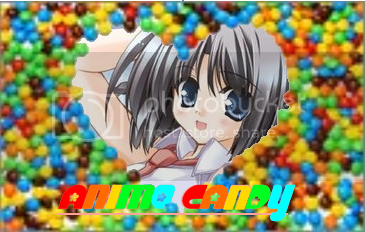 PLEASE VISIT ANIME CANDY! THE BEST ANIME FAN SITE! http://www.toolkitzone.com/toolkit.php RPG Toolkit - An Open Source RPG Maker heard about it from a GamePro article once. I started making a BASIC Interpreter for making Atari 2600 styled games, but need to code a better interface. So that's another if I finish it anytime soon. The code executes perfectly though. So that's a plus. On http://wiki.gamedev.net there are a few RPG Related Articles that are Programming Language Agnostic if you don't want to use an existing engine. RPG Map Tutorial that I used when starting out computer graphics. Dark Basic - A Variant of the BASIC programming language which means Beginner's All-purpose Symbolic Instruction Code for those of you CS majors. ;) But is a very powerful variant of BASIC with native Direct3D integration and support for both 3D and 2D Primitives. Native .X file support and animation is a boon, but it doesn't look like HLSL is supported. So if you want Pixel Shaders you seem to be out of luck. http://darkbasic.thegamecreators.com/ is where you can check out many versions. FPS Creator - This will probably have less appeal on this board, but I thought I should mention it. It is a fully featured simple point and click First Person Shooter engine that makes making your own FPS games easy as well, point and click. There are DirectX 9.0c and DirectX 10 versions the latter taking advantage of shader effects in droves. I'm close to completing a game in Rags that has 8 endings. which game maker should I use to make a game like cute knight? and i want to put all my games in my site, how can i do that? Any number of the things we mentioned previously could make a game with features similar to Kishi Kawaii. RPGMakerXP has a great Scripting System that presumably allows you to wrestle any number of not present features as well as giving you a top down walk around RPG view if you'd like. Game Maker has a great interface and scripting language that would be able to make a powerful game. DarkBasic or BlitzBasic would suite you fine as well as pretty much any of the others. Some wouldn't let you make a 1:1 clone, but they could be very similar features-wise. I've never used Ren'Py so I'm not really much of a goto guy on this sort of thing however, after quick inspection of the website. This Web Tutorial looks like it should assist you. As well as the Download Link for Ren'Py just in case you don't have it yet. Reference Manual - for those obscure questions. Lastly Background and Character graphics. Really for use with the Blade Engine, but they should probably work with Ren'Py. Sorry I can't be of more help, but it'll give you a good starting point. when i click on the renpy icon on my desktop, it leads to a renpy file. when i click the file many files come, and none of those files open a game maker. ren'py really doesn't open game maker thing like RMXP if that's what your saying. you need to do the whole game via script, or text. and ren'py will just generate it and it becomes a visual novel. I'm not really sure but I think a similar price. I would personally recommend XP rather than VX however, if you plan on buying one.